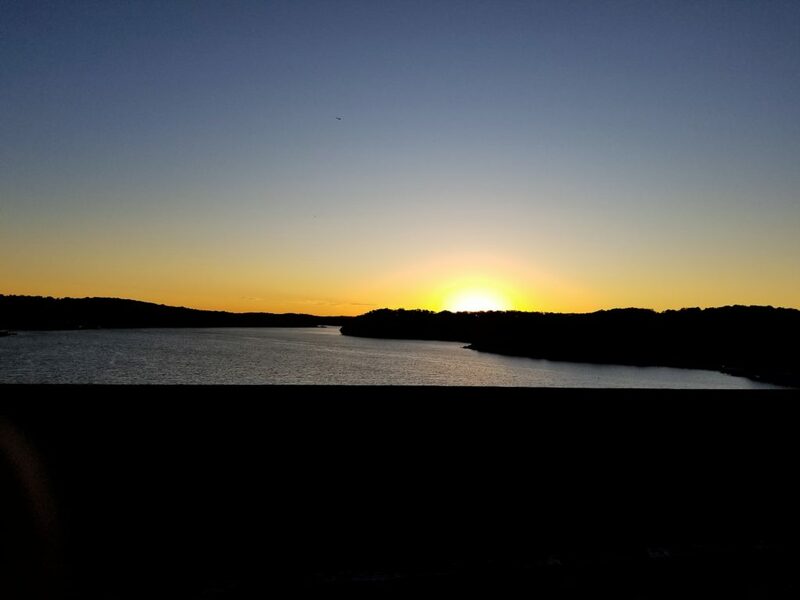 The sunrise over Truman Lake as we crossed a bridge. Catching shad in a casting net is no easy task. Clouds of them appeared on the electronics and surfaced around us, but the net repeatedly came up empty. The anticipation grew as we searched for the bait that would help us catch some monster, bottom-dwelling blue catfish on Truman Lake. Our captain for the day, Denny Hartmann, showed his physical stamina handling the net, making perfect throws into large schools and letting the net sink as far as it could. Although the throw sure looked pretty, nothing was produced for his efforts other than two unlucky crappie ten feet down. He quickly adjusted his strategy. Denny’s extensive knowledge of Truman steered us to the mouth of a small inlet. He expertly navigated the entrance, which hardly seemed wider than our boat. We were suddenly inside a small cove that was virtually unnoticeable to most passersby on the main lake. My jaw dropped, however, when I looked at the fish finder. It read nearly forty feet deep! I learned we were in an abandoned rock quarry. I wondered in amazement about the large dump trucks and loaders that once roamed the lake bed where we now casted for shad. On his first throw, Denny’s face strained considerably as he pulled, and I knew the haul was big. Shad and drum filled the net and my buddy Tyler and I helped him bring it in. In some ways, the net acted like a camera pulling up snap shots of the world below the boat. I enjoyed the chase for our bait, but now that our bucket was full at last, we sped off to catch the real prize of the day – those big bottom blues. After a chilly boat ride down lake, we arrived at a vast area of submerged timber that once was a dense forest years before the lake formed. Trees protruded from the water like weathered, leathery hands. As we idled along, the fish finder showed promising signs, and we found the perfect spot along a drop off into the main channel. With the boat tied off to some trees, Denny handed out poles and cut up the shad. An array of ten rods rigged with cut shad covered all sides of the boat. The boat’s “spider-rig” rod holders, most often used for crappie, worked perfect for the catfish rods as well. Within minutes, a rod bent over in front of me! A few short moments later and I had our first catfish in the boat. I learned quickly that blues are ferocious predators that feed on anything, but especially love shad. Once they caught the scent of the blood and oils from the shad on our hooks, they closed in. Just as I was resetting the pole, one of Tyler’s went down! There is never a dull moment with ten rods in the water. Just when the action appeared to calm, I heard Tyler’s excited voice. “Denny, this is a big fish!” he yelled. Most people have never seen a fifteen pound blue cat crest the water like a humpback whale, but I have. “How am I going to reel all these poles in?” I thought. Very quickly was the answer! As Tyler fought the big blue, I reeled in the other poles to avoid a tangled mess and the possibility of losing the fish. Denny stood nearby with the net, ready for the fish to appear alongside the boat. The drag buzzed, but was soon within reach and Denny scooped him up! After pictures and measurements, the Blue was released unharmed to hopefully be caught again. Although it was nearly 15 pounds, the fish couldn’t be kept because it was in the “slot” limit. 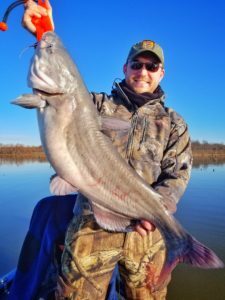 On Truman Lake, any blue catfish between 26-34 inches must be released immediately into the water. The rest of the morning produced several hard-fighting blues and the excursion concluded with some great eating keepers. Our trip was outstanding fun for all, even though the numbers caught ended on the slow side according to Denny. Blue Catfish, Catfishing, Fishing, Payden Hays, Truman Lake. Bookmark.